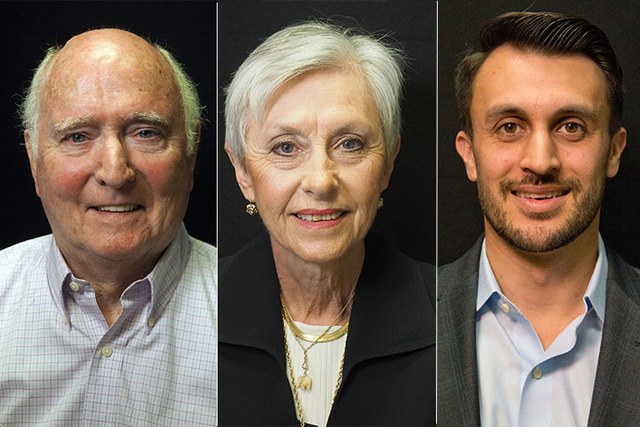 Solidly connected party workers with new ideas and connections will face off against old-guard candidates with years of life experience in both parties’ primary elections for Democratic-leaning Assembly District 41. Solidly connected party workers with new ideas will face off against old-guard candidates with years of life experience in both parties’ primary elections for Democratic-leaning Assembly District 41. Former three-term Assemblyman Paul Aizley’s road to return to the Assembly includes a primary race against political newcomer Sandra Jauregui, who once worked as an intern for U.S. Sen. Harry Reid on the Democratic side. For the Republicans, two candidates are making their political debuts with small-business owner and longtime party worker Nick Phillips facing off against Southern Nevada Tea Party advocate and Nevada newcomer Mary Rooney. The winners of the two June 14 primary votes will meet in the Nov. 8 general election. Aizley, who worked in numerous positions at UNLV since 1968, was elected to the Assembly in 2008, 2010 and 2012. He lost the District 41 Assembly race in 2014 during the “red wave,” when 13 Democratic candidates, including six incumbents, were swept out of office. Aizley wants to strengthen protections for Nevada’s senior citizens. Aizley said his experience makes him the better Democratic District 41 candidate. Jauregui concurs that she’s relatively new to Nevada — but she still has some political experience, serving as high school representative to a district school board in Hacienda Heights, California, in addition to interning as a UNLV student for Reid in 2009 when he was Senate majority leader. She also worked on housing issues with state Attorney General Catherine Cortez Masto. Jauregui said she believes she’s the better candidate for the Democrats because “I’m in it for the long haul” — that is, Aizley would be term-limited out after four years while she would be able to work for 12. On the Republican side, Phillips, an 11-year resident of the state, has been involved in local politics since 2010. After making connections with party leaders by demonstrating the use of a computer program and data he collected, Phillips was elected political director of the Clark County Republican Party in 2013. He assisted in campaign analysis for several races, helping the state GOP win majorities in the Senate and Assembly. Phillips said economic development will be the key issue of the 2017 legislative session. “This race is about somebody who’s involved in our economy and our community … against a lady who moved here seven years ago from Chicago, has never held a job here, has never employed anybody here, has never been schooled here, has no children in our school system here,” Phillips said. Rooney said she has plenty of experience in business and the fact that it occurred in Illinois doesn’t make any difference. But her political experience came entirely in Nevada. She worked on the campaign of Assemblywoman Victoria Dooling, R-Henderson. When Dooling opted not to run, Rooney stepped up to fill the void. Contact Richard N. Velotta at rvelotta@reviewjournal.com or 702-477-3893. Find @RickVelotta on Twitter.